Photo by Frank Corpus, from Ary Paloma Jeebie's Facebook page. Director David Leland’s 2003 documentary Concert for George played on a large screen in front of the stage as people entered Martyrs’ for the George Harrison Birthday Tribute Concert this past Saturday night. Showing the film not only gave the audience something to look at while Ellis Clark and other Chicago area musicians worked to get the concert underway, it set the mood for what was to come. Like the superstar event that took place at London’s Royal Albert Hall in 2002, the George Harrison Birthday Tribute Concert in Chicago was a celebration of Harrison’s music as well as his decidedly cool and benevolent outlook on life. Clark and his band The Big Parade, with special guest Ary Paloma Jeebie from the Amazing Heeby Jeebies, kicked things off with a set that included “Taxman,” “Old Brown Shoe,” and “Cry For A Shadow.” Sporting an Abraham Lincoln (or Ebenezer Scrooge) top hat, Clark and the elegantly dressed Ary Paloma Jeebie served as congenial and efficient hosts throughout the evening. They not only introduced each act, they often joined in the performances. Musicians drifted off and on the stage, but I believe it was a few members of Social Act that made the scathing “Piggies” even more fun by tossing in some Monty Pythonesque vocals. Phil Angotti joined Clark and Ary Paloma Jeebie on “Think For Yourself,” and there was a packed stage (including Mars Williams from The Psychedelic Furs) for a rollicking version of “Wah Wah.” The Handcuffs were in the midst of a set that included “Got My Mind Set On You,” “For You Blue” and “Bangladesh” when unfortunately, I had to leave to catch a train back home. At that point, there were still several acts that had yet to perform. 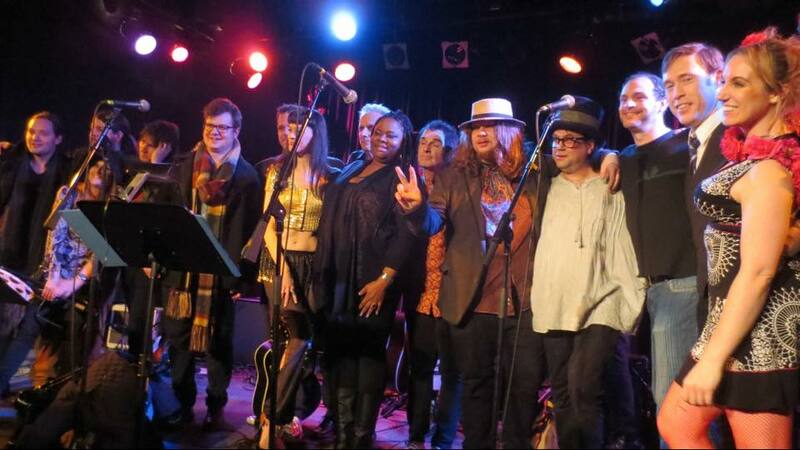 Like George Harrison’s legacy, the George Harrison Birthday Tribute Concert seemed like it could go forever. Regrettes, we’ll have a few. 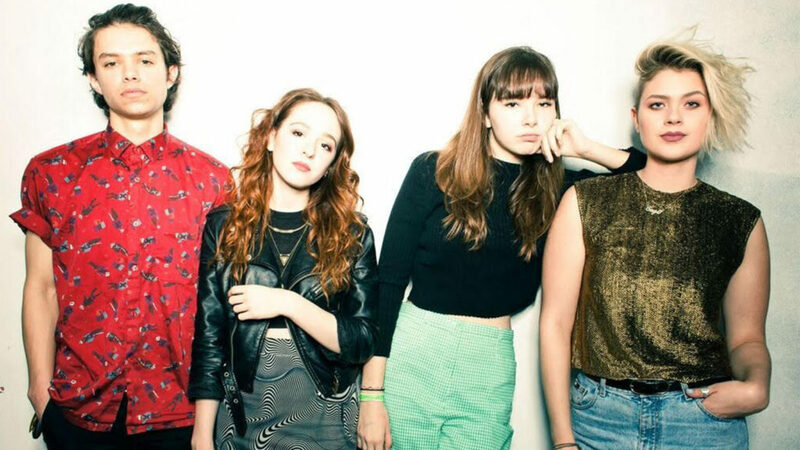 Photo from The Regrettes Facebook page. Congratulations to Ellis Clark and Ary Paloma Jeebie for hosting a truly fun George Harrison Birthday Tribute Concert at Martyrs’ last night. Several local bands took part and the event ran smoothly while exuding a benevolent vibe I’m sure Mr. Harrison would have appreciated. I’m hoping to post a review some time this week. The Regrettes have been creating a buzz on the L.A. club scene, and will be coming to Chicago for a show on April 2 at Schubas. On its new Feel Your Feelings Fool album, the band backs a two-fisted feminist message with catchy arrangements that mix vintage punk with the 1960s girl group sound. I’m hoping to post a review of the album some time this week. Chicago Acoustic Underground, which helped make last night’s George Harrison Birthday Tribute Concert at Martyrs’ a reality, used the event to debut its new printed publication Overdub. Issue 1 has features on singer-guitarist Anita Chase from The Lost Brigade and singer/trumpet player/composer Jeannie Tanner, as well as an illustration by Amazing Heeby Jeebies vocalist Ary Paloma Jeebie. The Second Disc website recently reported on The Zombies’ Odessey And Oracle: 50th Anniversary Edition being released on March 17 by the Varese Vintyage label. This latest version includes seven bonus tracks that are alternate mixes of some of the album’s original tracks, and arrives just as The Zombies are in the midst of an Odessey And Oracle: 50th Anniversary tour. Congratulations to former White Sox left hander Mark Buehrle on having his No. 56 jersey retired by the team. Buehrle compiled a 161-119 record with the Sox, and was chosen four times for the All-Star Game. Kedi, director Ceyda Torun’s new documentary about the free-roaming but not necessarily feral cats in Istanbul, is currently running at the Music Box Theatre on Chicago’s north side. 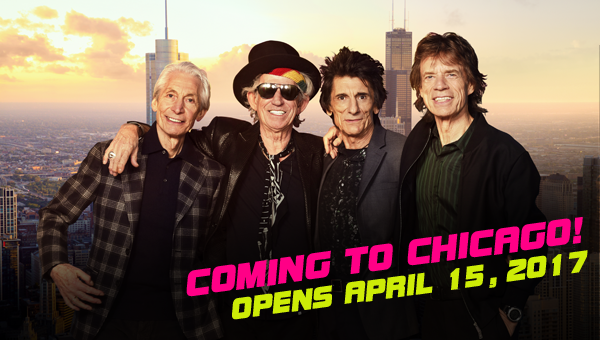 Tickets are now on sale for Exhibitionism, a massive exhibit of artifacts from The Rolling Stones, that opens on Navy Pier April 15 and will run through July 30. There will be an International Woman’s Day art sale from 1:00 to 5:00 p.m. on March 11 at Bourdage Pearls on Ravenswood in Chicago. Local artist Brenda Goodbread Walker will be showing some of her work and there will be an acoustic performance by Graham Elvis. 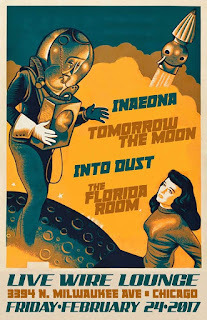 at 3:00 p.m.
It’s been a few years since the sci-fi/psychedelic band Tomorrow The Moon played a gig on the local scene. That could be because of vocalist-guitarist Steve Gerlach’s busy schedule since he’s also a member of the David Bowie tribute band Sons Of The Silent Age and has performed with The Bad Examples and Tommy Keene. Tomorrow The Moon will be at Live Wire tonight, along with the Boston-based prog rock/industrial trio Inaenona; The Florida Rooms, which is actually a three-piece folk/punk band from Chicago, and the local quintet Into Dust, whose Bandcamp page describes its music as “spooky and heavy.” Tomorrow The Moon’s latest album, the 14-song Blow, Mind Blow, is available on iTunes. This Sunday will be the last opportunity to catch The Invention Of Morel while it’s at The Studebaker Theater in Chicago. Former Police drummer Stewart Copeland was commissioned to compose original music for this opera, which based on a novel by Adolfo Bioy Casares. Tickets range from $39 to $125. Wilco will wrap up its Winterlude 2017 run at the Chicago Theatre tomorrow. The band released its latest album, Schmilco, in 2016. Ellis Clark and The Big Parade featuring Ary Paloma Jeebie will be hosting a George Harrison Birthday Tribute Concert tomorrow night at Martyrs’. Special guests include Mars Williams from The Psychedelic Furs, Carla Prather of Poi Dog Pondering, Phil Angotti, The Handcuffs, Aethereal, Social Act, The Polkaholics and Gunnar Cleermann all the way from Denmark. Admission is $12. The Chicago Sun-Times recently reported that the Abraham Lincoln Presidential Museum in Springfield will have a new exhibit titled “Cubs vs. Cardinals: The Rivalry.” It will feature rare and important items from both teams dating back through their long histories, and was created with assistance from The National Baseball Hall Of Fame. No word yet on whether the Barack Obama Presidential Museum will have a Cubs vs. White Sox exhibit. 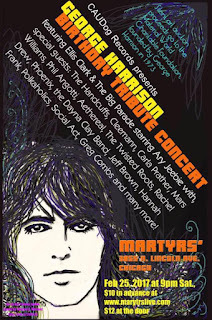 This coming Friday, February 24th would have been George Harrison’s 74th birthday and Chicago area Beatles fans will be able to have a fun time in his honor a day later at Martyrs’ on Lincoln Avenue. The George Harrison Birthday Tribute Concert will be hosted on Saturday night by Ellis Clark and The Big Parade with guest Ary Paloma Jeebie from the garage/rockabilly band Amazing Heeby Jeebies. A founding member of Epicycle and Social Act, Clark is also a solo recording artist and producer. Other performers include Mars Williams from The Psychedelic Furs; Carla Prather of Poi Dog Pondering; and singer guitarist Phil Angotti, who’s on the verge of releasing his latest solo effort. The Handcuffs, the coed indie band that’s led by vocalist-guitarist Chloe F. Orwell and drummer Brad Elvis (and once included Clark as a member), will also be on hand. Some of the other bands are Social Act, Aethereal, Rachel Drew, and The Polkaholics. There will also be a Silent Art Auction. 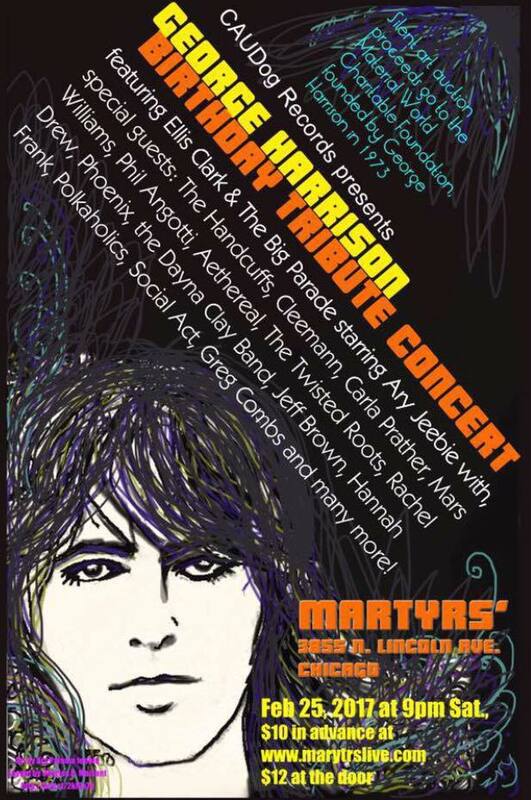 See the George Harrison Birthday Tribute Concert Facebook page for a full list of the performers. Admission is $12 at the door, and proceeds will go to The Material World Charitable Foundation, which was founded by George Harrison in 1973. The Rolling Stones will be planting a great big kiss on Chicago when the band’s Exhibitionism show arrives at Navy Pier on April 15 and keeps rocking through July 30. Featuring guitars, posters, film, fashion, personal notes, an art gallery and other memorabilia, Exhibitionism celebrates The Rolling Stones’ 50 years of dominating rock and roll. It draws from the personal collections of Mick Jagger, Keith Richards, Charlie Watts and Ron Wood, and has previously been staged by the Aussie-based iEC Exhibitions! in London and New York. As reported by Steve Johnson in the Chicago Tribune and Miriam Di Nunzio in the Chicago Sun-Times, Exhibitionism’s Chicago run was announced by Mayor Rahm Emanuel at a press conference last Thursday. Our city’s legacy as the birthplace of blues, along with The Rolling Stones’ early recordings at Chess Records make Chicago an obvious destination for this touring exhibit. Johnson quotes Navy Pier CEO Marilyn Gardner’s reason for wanting to be involved. Exhibitionism will no doubt remind some Chicago rock fans of the David Bowie Is exhibit that ran at The Museum of Contemporary Art in 2014. That event kicked off with the David Bowie tribute band Sons Of The Silent Age playing an afternoon concert at Daley Plaza, and according to Johnson, there will be Rolling Stones cover bands performing at the Navy Pier beer gardens throughout Exhibitionism’s visit. Tickets range from $25 – $35 for adults and $20 – $22 for kids 6 to 16. This could be the first time I’ll be buying souvenirs at Navy Pier. This coming February 24th would have been George Harrison’s 74th birthday, and there are some fun shows coming up in his honor. WXRT air personality Terri Hemmert will celebrate George Harrison's birthday on her Breakfast With The Beatles show this Sunday morning on from 8 to 10 a.m.
Congratulations to Breakfast With The Beatles contributor Professor Moptop on reaching his Kickstarter goal to fund his Textbook Beatles Vol. 1 project. Ellis Clark and The Big Parade featuring Ary Paloma Jeebie will be hosting a a George Harrison Birthday Tribute Concert on February 25 at Martyrs’. Special guests so far include Mars Williams from The Psychedelic Furs, Carla Prather of Poi Dog Pondering, Phil Angotti, The Handcuffs, Aethereal, Social Act, The Polkaholics and Gunnar Cleermann all the way from Denmark. Admission is $10 in advance, $12 at the door. If you want to impress the musicians at the Martyrs’ George Harrison Birthday Tribute Concert, tell them you ordered one of the limited-run, numbered and estate-stamped copies of I Me Mine – The Extended Edition from the U.K.-based Genesis Publications. This elite, updated take on the quiet Beatle’s 1981 autobiography is printed on Italian art paper and comes in a boxed set that includes an exclusive vinyl record. The price is £245.00. Or you can go with the far less elaborate version for $36.81 on Amazon. Chicago sci-fi rockers Tomorrow The Moon perform their first show in about a year when they open for the Boston-based InAeona trio next Friday, February 24 at Live Wire. Tomorrow The Moon’s latest album, the 14-song Blow, Mind Blow, is available on iTunes. Psychedelic Saturday takes place February 25 at Live Wire. The Red Plastic Buddha, a band on the front lines of Chicago’s vibrant psyche scene, will host Diagonal, Lord Stanley, and Duende. The hard-hitting English band The Godfathers is back in action with A Big Bad Beautiful Noise, its first album since 2014. As noted by critic Tim Stegall in his review for Magnet, The Godfathers regrouped eight years ago, although lead vocalist Pete Coyle is the only original member. Stegall gave A Big Bad Beautiful Noise nine out of ten possible stars. Other new albums include Live In Paris by Sleater-Kinney and Reflection by Brian Eno. 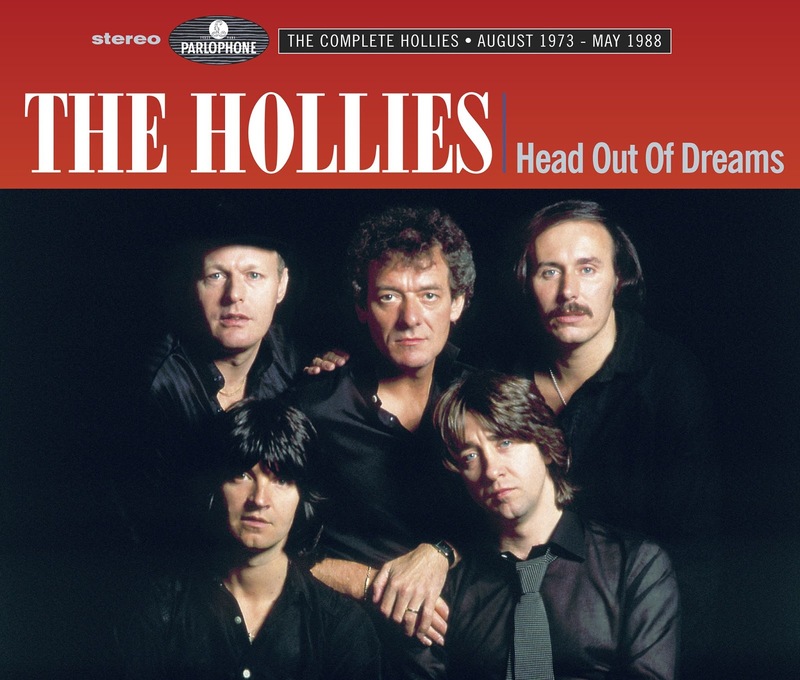 The Hollies have released a six-CD box set titled Head Out Of Dreams: The Complete Hollies August 1973 – May 1988. It includes official recordings from the band throughout that time period, as well as a 24-page booklet and the previously unreleased "You’re All Woman" and "You Gave Me Strength." . Critically acclaimed and beguiling indie rock artist St. Vincent is the official Ambassador for Record Store Day this year. The annual springtime event (there’s also a Black Friday version in November) is now in its tenth year of offering exclusive, one-day only treasures on vinyl. RSD takes place on April 22. Streetwise, the Chicago publication dedicated to providing income to the homeless as well as a path back to productive lives, is holding a 21-and-older Karaoke Fundraiser on March 4 at 3415 N. Clark. The $25 admission includes unlimited well drinks, drafts, and shot specials. There will raffles, and participants get 25% off the entire food menu. Tickets went on sale today for the intriguing double bill of the Psychedelic Furs and Robyn Hitchcock on April 8 at Thalia Hall. Other shows that went on sale today include Laurie Anderson at Old Town School Of Folk Music on April 6; Joe Ely at SPACE on May 4; Steve Forbert at SPACE on May 19; and Screaming Females with Metz at Empty Bottle on March 4. Now that the band Take Me has reunited, it should be interesting to see what kind of shows they’ll play on the Chicago area club scene. 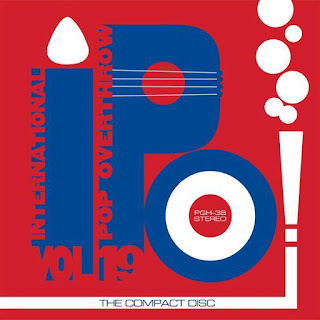 Back in its heyday, Take Me put together a playlist of cover versions that incorporated up-and-coming power pop bands like Shoes, 20/20, The Paul Collins Beat, and Ian Lloyd. In fact, I discovered some of my favorite bands of that genre via Take Me gigs. The 33 – A Cabinet of Curious Characters New Works by by MaM! exhibition continues its at the Rotofugi Designer Toy Store and Gallery at 2780 N. Lincoln Avenue in Chicago through February 26. NOTE: There are numerous spoilers in the following piece. Gloria, Branden Jacobs-Jenkins’ dark comedy about the hyper-competitive atmosphere among the millennial employees at a major publication, wraps up its run at The Goodman Theatre this weekend. It was widely praised in its original staging at the Vineyard Theatre in New York, but reaction from Chicago-based theatre critics has been mixed. Having seen the play last weekend, I can understand why there are conflicting opinions of it. The cast members (imported from Vineyard) do well with the sharp and true-to-life dialogue Jacobs-Jenkins has provided, resulting in a lot of funny conversations. Director Evan Cabnet maintains a steady pace to keep the audience engaged, and creates the disturbing climax of Act One with accelerated tension and well-executed (pun intended) violence. Still, the impact of that scene will likely be less powerful for anyone who has read the aforementioned reviews or even seen the Gloria newspaper ads. We sense early on that Gloria, who is not a major character, will justify having the play named for her by carrying out some sort of mass attack. The only question is who her victims will be. Jacobs-Jenkins continues to mine dark humor throughout the second half by exploring how the survivors scheme to cash in on their fellow workers’ misfortune. But the final scene misfires by bringing back Lorin, a previously minor character who could have been one of Gloria’s multiple fatalities for all the audience knew, to provide a moral center. The main characters are all evil, deranged, or deceased. Showing up as a temp at a Los Angeles-based film company two years later, Lorin is outraged to discover that Nan, an editor at his former company, is on the verge of signing a major deal for her account of the mass murder. He offers extensive and previously unavailable information to discredit her, including things that don’t make much sense. Lorin claims that the only action upper management at his former company took after being informed that an employee was seen loading a gun was to send an e-mail to managers warning them to lock themselves in their bullet-proof offices. The concept of abandoning the rank and file to a serial killer definitely qualifies as dark humor, but would any company really send an easily traceable message that could result in millions of dollars in lawsuits? And how many nongovernment offices even have bulletproof windows for their managers? Plus, by the time Nan’s script could be made into a movie, at least three years would have passed since the incident. There’s a comment earlier in the second act that people will forget Gloria’s killing spree as soon as the next massacre takes place in America. There’s a chilling truth in that observation, but it also undermines one of the play’s main themes. Micky Dolenz has a show tomorrow night at The Arcada in St. Charles. Other upcoming shows at The Arcada include Greg Kihn on March 10, Poi Dog Pondering on May 13, and Denny Laine of Moody Blues and Wings fame with Fran Cosmo from Boston and Joey Molland from Badfinger on June 10. In other Monkees news, The Second Disc website recently reported on a new seven-inch single from 7A Records that features Davy Jones performing “Daydream Believer” and “I Wanna Be Free” in Japan back in 1981. The release will be limited to 500 copies on clear yellow vinyl, and is available on Amazon. Those of us who couldn’t make it to the Los Angeles Convention Center tonight to see Tom Petty will being honored as the MusiCares Person of the Year, had an opportunity join in some of the fun via live reports on the MusiCares Facebook page. 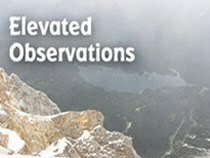 Visitors can still help out the charitable organization by clicking on the page’s Donate Button. The MaM! exhibition The 33 – A Cabinet of Curious Characters continues at Rotofugi Designer Toy Store and Gallery through February 26. Rotofugi is located at 2780 N. Lincoln Avenue in Chicago. Factory Theatre is having a launch party for its latest production Born Ready next Thursday, February 16 at the Little Unicoco Nigerian restaurant on Howard Street. Born Ready, a play by Stacie Barra set in the 1950s, concerns an elderly former child star and a much younger woman performing as a comedy duo. It officially opens on March 24 at Factory, with previews starting on March 17. Liz And The Lovelies, a Chicago area band that describes its music as folktronica, have a release show for their five-song EP Progress Into Simplicity coming up on April 4 at the North Bar in Chicago. I caught a solo set by singer-guitarist Liz Chidester, who’s originally from Virginia, a while back at The Abbey Pub, and was impressed with her songwriting and powerful vocals. This should come as no surprise to those of us who’ve seen bassist Derrick Anderson perform live with The Bangles and The Smithereens, but it’s still very cool news. Anderson has an album coming out on April 7 that will include guests appearances from Matthew Sweet, along with members of The Bangles, The Smithereens, The Cowsills, and The Muffs. The video for his song “Happiness,” which can be seen on the Blurt website, is certainly promising. Singer-guitarist Phi Angotti has kept busy with tribute shows for The Rolling Stones, The Beatles, The Monkees, and other famous acts over the past years, but he returns to making original music on his upcoming Such Stories album. His latest release will be a mostly acoustic effort that includes a track based on a Twilight Zone episode. According to Angtotti’s Facebook page, we can look for Such Stories and a release show sometime in March. Actor Peter Capaldi recently announced on BBC Radio 2 in the UK that he won’t play the title character in Doctor Who after the current season. As reported in the science/culture website The Verge, Capaldi felt it was time to move on. A replacement for the role has yet to be announced. Today’s issue of the Chicago Sun-Times has an item by staff reporter Miriam Di Nunzio regarding a new film about Chicago improv pioneer Del Close. Mike Meyers, who performed at Second City long before his Saturday Night Live, Wayne’s World, and Austin Powers days, is slated to portray the late actor/director. Second City alum (and former Hill Street Blues cast member) Betty Thomas will direct and it’s believed most of the film’s scenes will be shot in Chicago. Chicago free paper Red Eye moved to its new weekly format yesterday with a fifty-page issue that focuses on food and entertainment. The Reader, which has been coming out every Thursday for decades, responded with ads in the Sun-Times proclaiming itself as Chicago’s Only Weekly That Matters. The Reader has a well-earned reputation for political reporting as well as its entertainment coverage, and combined the two this week with a cover story about local musicians defending the Affordable Care Act. As I’ve said a number of times on this blog (and in articles for the Illinois Entertainer), International Pop Overthrow is a great way to discover new bands. Founder/CEO David Bash creates a unique mix of local talent and a few out-of-towners for each of the cities he visits on his annual tour. The schedules are posted in advance on his official IPO website, with links to most of the acts that will be involved. That makes it easy to find new music even if you can’t make it out to the live shows. The International Pop Overthrow CDs serve the same purpose, and the recently released three-CD collection Vol. 19 once again showcases power pop and indie rock acts associated with this traveling music festival. Considering there are 65 songs on Vol. 19, you could practically stage your own International Pop Overthrow festival. Just put on a stylish hat and flip open your laptop to take notes and you can be just like David Bash. The CEO/Founder gets a shoutout from IPO vets The Tearaways on “BASH,” which sets a barrage of clever wordplay to a synth and guitar arrangement reminiscent of The Cars. Although there are various shades of music on Vol. 19, all the acts seems to put an emphasis on creating a strong melody. Colorworks, Trip Wire, Yoav Arbel, and The Satisfied Minds opt for the lighter side of 1960s, while Awkward Talker, Metropolitan Farms, and The Starfire Band offer authentic garage rock. Ron Dante, marston, and The Black Lemons add a touch of rhythm and blues; Deborah Henriksson delves into jazz; and Nina And The Buffalo Riders offer some country and western twang. The always reliable Laurie Biagini once again adds a modern twist to the girl group sound. International Pop Overthrow returns to Chicago for a nine-day run at The Red Line Tap starting on April 21. Gregory Alexander isn’t a real professor but he plays one on the radio. His lectures are only a few minutes long and he usually offers two each Sunday morning as part of WXRT air personality Terri Hemmert’s Breakfast With The Beatles show. His pseudonym Professor Moptop befits a guy who conducts extensive research in all things related to The Beatles—their inspirations, peers, projects, and personal quirks. So it’s not surprising that he’s now channeling all that energy into a new role as a paperback writer. Alexander/Prof. 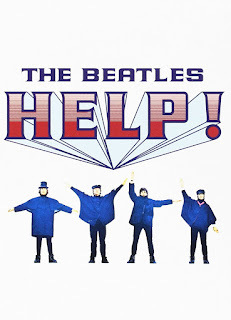 Moptop, a faculty member of the fictional Beatle University, has already met his goal to raise on $4, 489 on Kickstarter for his Textbook Beatles Volume 1, with seven days left. A $25 pledge will earn you a copy of the book; fork over $50, and you’ll get an autographed edition. He’s offering other perks for a variety of of pledge amounts. Judging from the wealth of information and low-key humor Professor Moptop brings to Breakfast With The Beatles, it’s likely that his textbook will be an entertaining read. Professor Moptop will be at the Deerfield Public Library this Saturday at 1:00 p.m. to share his “critical analysis” of Help. 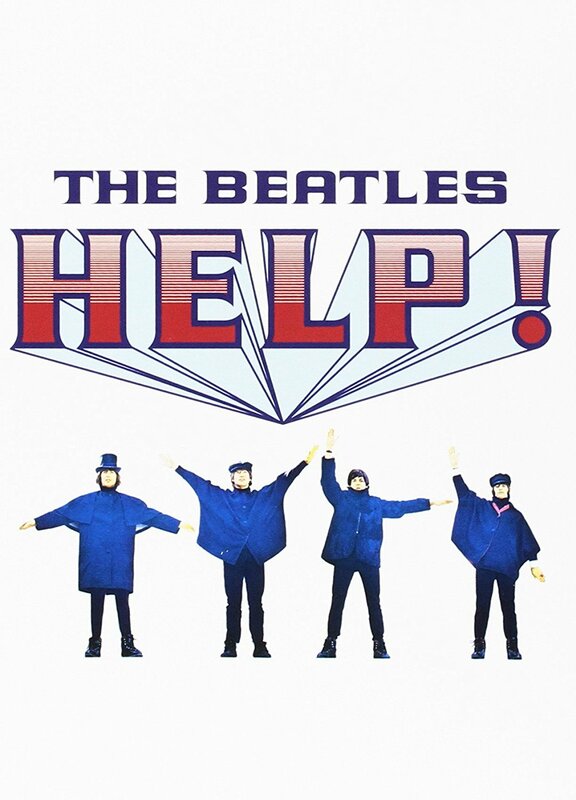 A screening of the The Beatles’ second film will follow his presentation. The library is located at 920 Waukegan Road in Deerfield, IL. Admission is free. 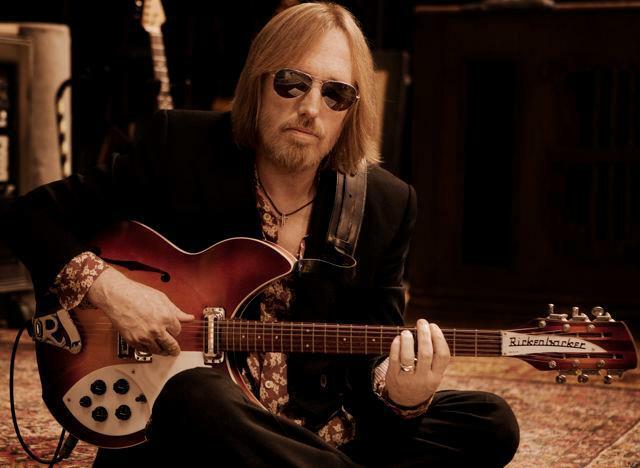 Tom Petty will be honored as the 2017 MusiCares Person of the Year at a special event on February 10 at the Los Angeles Convention Center. The award presentation will be followed by a multi-act tribute concert featuring The Foo Fighters; Norah Jones; The Bangles; Kings Of Leon; Jackson Browne, Chris Hillman and Herb Pedersen; Gary Clark, Jr.; Stevie Nicks and Lucinda Williams; Randy Newman; Don Henley; Jeff Lynne; Elle King; George Strait; and Regina Spector. The Bangles Facebook page notes that the MusiCares Person of the Year gala is traditionally part of Grammy Week. The Grammy Awards take place two days later. The Lilacs, Material Reissue and The Bad Examples triple bill at Metro on March 4 just got even more interesting after Material Reissue drummer Mike Zelenko posted on his Facebook page that the band will be performing some new material. The all-ages show is scheduled to start at 6:00 p.m.
Other noteworthy events coming up in the next few weeks include Tomorrow The Moon opening for the Boston-based trio InAeona on February 24 at Live Wire; the Psychedelic Saturday hosted by The Red Plastic Buddha at Live Wire on February 25; and The George Harrison Birthday Tribute Concert hosted by Ellis Clark and The Big Parade at Martyrs at Martyrs’ on February 25. The Party On! 25 Years Of Wayne’s World festivities kicked off today in Aurora, IL with a poster contest at the If These Walls Could Talk gallery. Other activities are planned for spring and early summer. There was an opening reception tonight at Rotofugi Designer Toy Store and Gallery for The 33 – A Cabinet of Curious Characters New Works by by BaM! The exhibition, which features antique cabinet card portraits reinvented by artists Bruce Bachelder and Mike Rende, run through February 26. Rotofugi is located at 2780 N. Lincoln Avenue in Chicago. It’s great to be around for a quarter of a century. 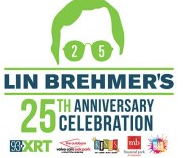 Congratulations to Lin Brehmer on his 25th Anniversary as WXRT’s early morning DJ. He marked the occasion this morning with a live broadcast from Kings Bowl at MB Financial Park in Rosemont. 10,000 Maniacs will perform two shows each night on February 10 and 11 at City Winery Chicago. Billy Bragg has a show coming up on February 21 at the Old Town School Of Folk Music. Tickets are now on sale for Bob Mould’s show April 21 at Thalia Hall. New City, the long-running Chicago free paper, published the first issue in its new monthly format this week. 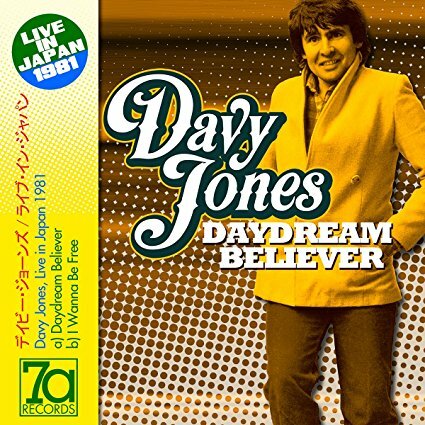 Looks like the MOJO magazine with a Ray Davies cover story and Kinks tribute CD still hasn’t come out in America yet. At least it wasn’t at Reckless Records in downtown Chicago when I dropped by there yesterday. By the way, Kinks fans have a chance to win a copy of the band’s new Deluxe Mono box set if they visit the Record Store Day website. The contest ends 2-20-17. Record Store Day, now in its 10th year, takes place on April 22 and I already have visions of rare vinyl releases dancing in my head. Graham Cracker Comics, just east of Reckless Records on Madison, has those cool-looking Star Wars Micro Comic Collectors Packs that include a comic, puzzle card, 3D poster and 3d glasses. They’re also available on Amazon. Chicago area Fleetwood Mac fans anxiously awaiting the new Christine McVie/Lindsey Buckingham collaboration can celebrate the band’s music when Fleetwood Mac Mania comes to the Metropolis Performing Arts Centre in Arlington Park on March 24. The venue describes the show as “a stunning visual and musical tribute.” Tickets are $35. Other shows coming up at the Metropolis include Rosencrantz and Guildenstern Are Dead, currently running through March 18 and Hair, which runs from May 18 through July 1. WXRT’s Lin Brehmer has no doubt had his share of interesting encounters with rock stars over the years. Like trying to interview Emmylou Harris without revealing his undying love for her; or chatting with U2 when they first came to the States and pronouncing Bono’s name as if the singer was married to Cher. Brehmer might relate a few a those tales tomorrow morning when he celebrates his 25th Anniversary as the Chicago progressive rock station’s morning DJ with a live broadcast from Kings Bowl at MB Financial Park in Rosemont. The festivities start at 5:30 a.m. and according to the WXRT website, will include live music and special guests. My favorite Brehmer/rock star story is the one about how he brought The Hoodoo Gurus home to meet his wife somewhere around 4:00 a.m. after having seen them in concert and partying with them for a few hours. Brehmer’s fellow air personality Marty Lennartz mentions this incident in an ad that’s currently running on the station, so I’m assuming it’s true. Although the name Hoodoo Gurus might conjure some funny images, I’ve seen the Australian band perform on a couple of occasions and they seem like nice guys. And they create fun, high-energy, irresistibly catchy songs. So, in celebration of Lin’s 25 years as our “Best Friend In The World,” and because Australians are our good friends, let’s rev up “Party Machine” by The Hoodoo Gurus. I was hoping for a live performance video, but this is the only clip I could find on YouTube.